TLC’s integrated library system for schools is specially designed to accommodate the needs of teacher-librarians in any school library, ranging from exclusive private institutions to major urban school districts. Among the schools that entrust their library operations with TLC’s Library•Solution for Schools are Chicago Public Schools, Hawaii State Department of Education, Loudoun Country Day School, Simcoe County District School Board in Canada, and St. Peter’s School in the United Kingdom. Long after a system is installed, TLC continues to support its school libraries with ongoing product development and unparalleled customer service. Teacher-librarians shouldn’t need to be techies to run their library and cultivate a love of reading among students. TLC’s Library•Solution for Schools automation system is designed with intuitive, easy-to-use interfaces that enable teacher-librarians to promote information literacy and support instructional standards. 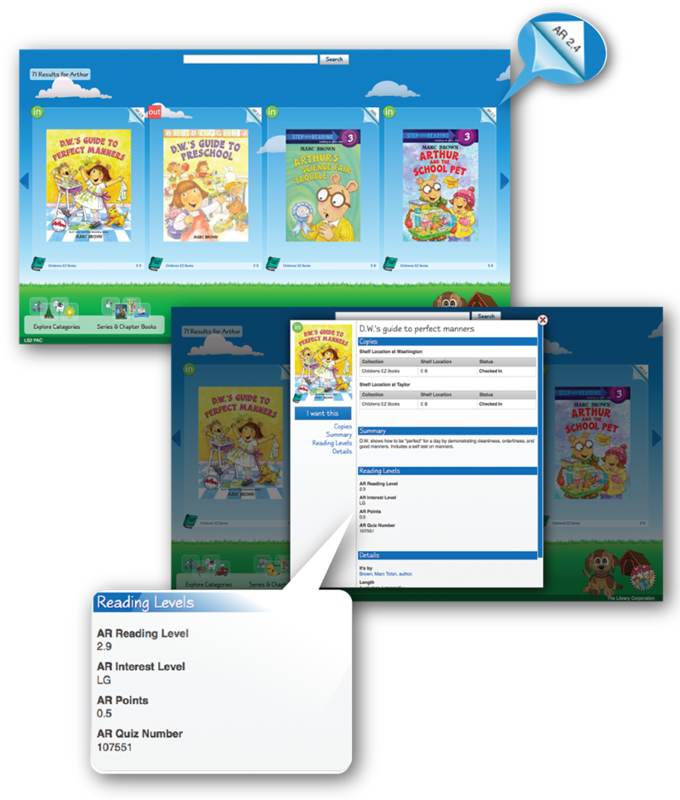 Library•Solution for Schools includes Reading Level Integration, a powerful service that pulls data directly from Lexile and Accelerated Reader vendors and associates by ISBN for searching and display. This means your catalog will always be up to date with the most current reading level data while reducing your cataloging time. TLC’s Reading Level Integration has robust searching capabilities as users can search by an individual reading level or a specified range, and see the information directly in their search results. Library•Solution for Schools is bolstered by a full suite of Web-based modules – LS2 Staff, LS2 PAC, and LS2 Kids – that deliver age-appropriate, customizable, highly attractive catalogs for students ranging from kindergarteners to high school seniors. Library•Solution for Schools and its LS2 enhancements are scalable and optimized for touchscreen devices, so library resources can be shared seamlessly throughout an entire school on wireless tablets and laptop computers, providing outstanding support for individual classroom instructional programs. Installed on your district’s servers or implemented online via TLC Hosting, Library•Solution for Schools is an easily maintained, affordable automation system that aligns your media center with all of your school’s instructional programs. LS2 PAC is an exciting, flexible, multi-application platform that merges library automation with the user-friendly interfaces and mobile adaptability. LS2 Kids is the children’s version of TLC’s successful LS2 PAC – the same robust technology with new features oriented to younger library users. It’s powerful software with an intuitive, easy-to-use interface that helps children find exactly what they’re looking for within a library’s collection. Use LS2 Staff to perform basic circulation functions from an Internet browser.